Writing a short story can often be intimidating, even if you've finished a novel recently or some other grand project. Despite it's brevity, a short story is much looser in its structure and up for a lot of interpretation. Because of this, if you're struggling with short fiction, it becomes difficult to look to classic structure for guidance—even if you're writing a more structureless piece. Plus, not only is the structure much different, but it also requires more efficiency with your words, which is why knowing how to write a short story outline can be a lifesaver for some in the brainstorming phase, and even great for writers approaching second and third drafts! Of course, before you begin outlining your short story, it's important to note that you must also first have a short story idea. If you don't look into ways to discover new ideas in your environment or by looking to work you admire. After you've created or discovered your short story idea, only then you can then begin outlining your story. This is, of course, if outlining is your preferred method of creative writing. Step 1. Summarize your short story. Whether you have a small, seemingly uneventful short story idea or fully developed character arc, you'll want to first begin by summarizing your short story. This can be by just talking about what you want to happen in your short story or to actually discuss the narrative from start to finish. It's up to you, though there are no hard rules here as this phase is just to help you nail the idea on paper. A young woman witnesses something out of the ordinary at work and decides to investigate it. This may not seem like much, but if you can take this one-sentence summary and expand on it with one or two more sentences, you already have a solid start to your outline. Step 2. Define your character's theme and importance to your story. Next, put your story's summary aside and write down your main character's name, or a temporary name if you haven't decided on one yet. You can even just write "main character." From there, write down your character's theme and what they represent. Write why they are important to the story and what they are trying to express in this story. Then, explain what you are trying to say with them as well. My main character is all about examining workplace habits and Americans desire to overwork themselves. Yes, it really can be that simple if needed. You may think that you need to devote time to working out further characteristics, be it external or internal, but given that short stories are so short, it's far more important (in my opinion) that you nail down the theme and reason of your character for the first draft than it is the appearance, as the appearance can easily change. The theme, on the other hand, is interwoven into every aspect of your short story and hard to omit once you've started. Step 3. Define your story's theme. Once you know your character's reason for being in the story, you'll want to focus on the general theme of the story. You may think that this will be the exact same thing as your character's theme, but that is not always the case. Often, in short fiction, the character is making one point while the overarching story, including the main character, makes a different one, or one in addition to who the main character is. My story is about work environments and how they appear to have improved, but actually haven't. As you can see, this somewhat relates to the character's theme, but not exactly. It's okay if it relates exactly the same or somewhat differently, it's just important that you understand the themes of both separately before combining them together in an outline and short story. Step 4. Outline your short story at a high-level. 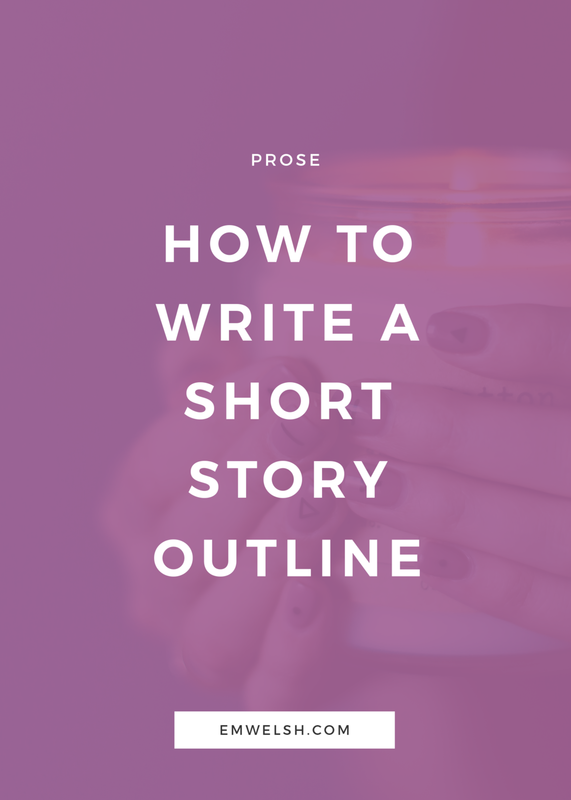 After you've defined the core concepts that power your short story and its reason for needing to be written, you can now write the short story outline at a high-level, ideally connecting the summary to the story's theme and the character's theme. This high-level approach is great for those who maybe don't like to outline or prefer outlines that offer flexibility. However, even if you prefer in-depth outlines, you'll want to start at a high-level for your short story, so if you decide your in-depth one isn't right, you can return to your story's core. Plot Point 1: A brief glance at ordinary life. This can often be so brief it is only a sentence or a few words, or it can take up a large portion of the short story. Plot Point 2: Something out of the ordinary happens. What is out of the ordinary can vary. It can be that someone arrives and interrupts the characters usual way of life, or it can be more subtle and just involve a new perspective or shift in a mood. In other words, a change occurs. Plot Point 3: The character responds to the change. This can be by ignoring it and remaining unaffected, or by addressing it and experiencing the consequences, no matter how insignificant or significant they may be. Most short stories do not have an ending the way a novel would. While yours might, to keep the outline at a high level in this point of the process, we really only want to focus on these three plot points. Not everyone likes to work out every single detail of their story in an outline. Some prefer to instead discover the rest of the story as they write, and if that is the case, the high-level, looser outline from step four is more than enough. However, other writers feel that if they work out all the details in the outline they can spend more time focusing on perfecting their language and prose during the actual writing phase. For those people, it is preferable to take the higher-level outline and break it down further. For each plot point in your outline, you'll want to break down all the scenes in the work. One way to do this is to write each major plot point on a separate piece of paper so as to separate each part of the story, but you can easily do it all on one sheet as well. Beneath each plot, make a list of every possible scene that has to happen for you to get from the beginning to the end of each plot point. If needed, write down whatever comes to mind, then cut it down afterward. After you've done this, move on to writing out the "beginning, middle, and end" of each scene. Again, how much detail is up to you and your needs as a writer. Plot Point 1: A brief glance at ordinary life. A scene demonstrating my protagonist unhappy, but at ease with their coworkers. A scene showing my protagonist's regular life. A quick scene—more like a flash—of the life they want. As you can see, you can continue to break it down as much as you'd like until you feel you have a solid plan for approaching your short story. Granted, because short stories do not have a distinct or common structure we find in them, it is often difficult to pin down a particular flow or outline for the work! However, I hope that this brings clarity to those who are struggling and allows those who need the flexibility some room to breathe. If you found this helpful, let me know! I'd love to expand this into a worksheet or workbook to further help those who want to master short story writing further!